The night swimming happened, April this year and I am still thinking about it. The truth is I'm having second thoughts in joining the said outing organized by the hospital celebrants. Why? He's still a baby and I'm wondering if he can survived the coolness of the night. We arrived at 5:30pm in 4k Garden Resort in Catmon, Sta. Maria, Bulacan. There were a lot of people around for an overnight swimming. Every one of the group were so excited especially the children. I am advised to cover Baby Chrizs body with oil before swimming. At least, he will not catch cold that easy. 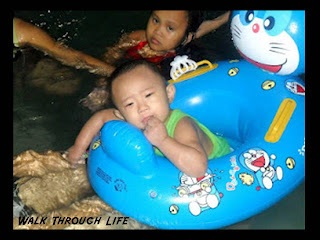 When we went for swimming, I'm so thankful that the water in Kiddie's swimming pool is warm. I place Baby Chrizs life bouy around his belly. Then, dip half of his body into the swimming pool.